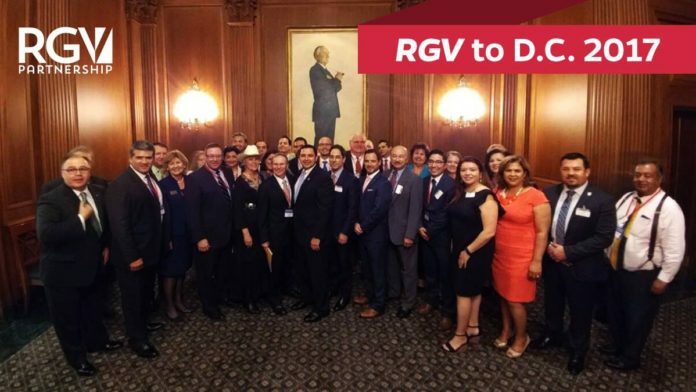 Valley leaders meet with U.S. Rep. Henry Cuellar in Washington, D.C. this week during a trip organized by the Rio Grande Valley Partnership. McALLEN — The first Valley-wide trip to Washington happened this week in an attempt to educate those at the capital who have not been here to visit. “I see officials from Austin, D.C., they talk about the Valley in a negative light,” Rep. Henry Cuellar, D-Laredo, said in a conference call Wednesday. The goal for the group was twofold — to “tell the Valley’s story,” using officials from across the four Valley counties to help with that education. The other part was to ask for resources that will help the Valley and in turn, help the country, especially in regard to trade and infrastructure. The visit was put together by Sergio Contreras of the Rio Grande Valley Partnership in Weslaco. Local municipalities and institutions were represented. Contreras said they met with the Valley delegation in the House, Texas Republican Sen. John Cornyn, non-Valley members of Congress and various agencies regarding health economics, Homeland Security, Customs and Border Protection, General Services Administration and the U.S. Small Business Administration. South Texas College President Shirley Reed told many of the officials in Washington about the Regional Public Safety Center that combines local, state and federal law enforcement. Contreras added that officials from the Port of Brownsville were very active, as were those from the Pharr-Reynosa International Bridge. As the trip concludes, Cuellar said he’s hosted other parts of his district — Laredo, San Antonio — for their annual Washington trips. “We’re doing this in June and I would suggest to Sergio and the team to do this in February or March,” Cuellar said, “because our appropriation process starts in March.